While the stadium was almost ready in November, fans still had to wait half a year until the very first game. On May 3 opening of Borisov Arena took place, but ironically without the home team. BATE Borisov held their first game after relocation from the municipal stadium on May 10, against Slutsk. The home side won 3:0, but only one in two seats were sold with 6,785 people in attendance. First chance for a sell-out comes this week as BATE faces Dinamo Minsk, who the Borisov side took the premier league lead from last week. Surely European fixtures will bring more people in. After all, it was the international success that brought BATE Borisov to the spotlight and also caused concerns over where the club should play during European competition games. Decision was thus made over four years back to build a brand new arena and works were expected to begin in November 2010. 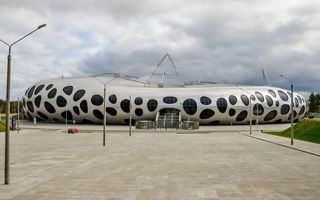 Designed by Slovenian Ofis Arkitekti, the stadium is located south-west of Borisov, near the road to Minsk. It’s surrounded with pine forest and emerges from the ground like an amorphous blob. In reality the outer shell is fully symmetric, but irregular holes in the façade make an impression of undefined shape. Inside the single-tiered stands are equipped with uniquely-coloured seats and accessible from a promenade surrounding the whole stadium. Four gates/ramps lead to the promenade, each located in one corner. Player and VIP access is located near the main grandstand.